"Collegium Instrumentale Alois Kottmann" was founded in 1968 with the aim of creating an orchestral sound which is rich in overtones, translucent and revealing. The first public performance was preceded by several years of ensemble playing which began in the Kottmann violin classes and continued after the conservatory studies had finished. Young violinists were also given support as soloists. Right from the outset the "Collegium", as it is commonly abbreviated, had a special aura - something which it has retained despite the changing generations. 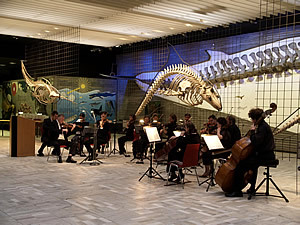 A Frankfurt ensemble supported by its own society (set up by the Bethmann family), the Collegium has played concerts in the USA, Mexico City, the UK and elsewhere. Its home podium is the series of Senckenberg concerts in Frankfurt, in which works of Frankfurt composers are performed to this day. It was also the founding orchestra of the regional Gallus concerts in Flörsheim am Main. The renowned "Philippsruher Schloßkonzerte" in Hanau are played exclusively by the "Collegium Instrumentale Alois Kottmann"
Larger symphonic works can be performed thanks to regular cooperation with the wind soloists of the major orchestras in our region. Besides maintaining high artistic standards in its regional concerts the "Collegium" also shows a degree of social commitment, e.g. providing aid for drug addicts (the leader was made an honorary member of "Drogenhilfe 80" by the former Vice President of the German Bundestag, Annemarie Renger), the Multiple Sclerosis Society and Karlheinz Böhm's "Menschen für Menschen" initiative, to which one of the CDs is dedicated.